Creamy Chicken Pasta is a cinch to make. 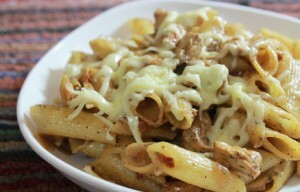 Very easy and quick to prepare pasta can be thrown as weekend dinner that is surely warm you up. Just you need to get little knowledge on Italian herbs and prepare a wholesome delectable pasta in couple of minutes. You can add some veggies to make it healthier.